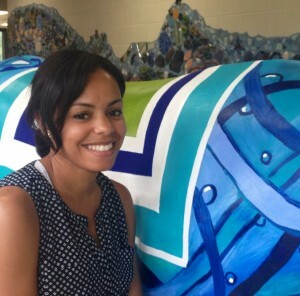 Ox: Dexter Philip Oxford, III "Oxie"
Something about large-scale collaborative murals is in her veins as Joslyn Johnson has worked with students and staff to create well over a dozen murals in her tenure as an art teacher for the Hopewell Valley Regional Schools. Eleven of those murals have been created at Bear Tavern School where she has been the art teacher since 2010. In her first year at Bear Tavern, she challenged the entire school community to collect colored, plastic bottle caps to create a piece of true “green art” relying on recyclables and creativity to create the beloved 12’x9’ bottle cap mural at the entrance to the school which cost a mere $120 to create! Prior to teaching at Bear Tavern where she earned the 2014 Teacher of the Year Award, Johnson taught at Timberlane Middle School and ceramics at a high school out of district. Johnson received a bachelor’s degree in art education from The College of New Jersey. Beyond creating murals, particularly mosaics, she enjoys the challenge of using recyclables and uncommon materials for a twist. Bear Tavern students created a depiction of Van Gogh’s “Starry Night” using keys and locks to illustrate movement and show tonal value. Johnson enjoys spending time outdoors with her family biking, canoeing and playing soccer.